The Investigative Unit uncovers internal emails and memos showing the San Jose Fire Department’s response times are worse than the already failing numbers it reported to the public. Shunda Mitchell speaks fondly of the San Jose Fire Department, who has responded to six medical calls to her home over the last year. “My life depends on them,” she said. Mitchell is a pancreatic cancer survivor who now suffers from Type 1 diabetes. When her blood sugar gets too low, she goes into a seizure and passes out. That’s when her husband, John, makes that nerve-racking call to 9-1-1. “They should be there as soon as they can,” John said. The San Jose Fire Department is required to arrive at the Mitchells’ home in under eight minutes, 90 percent of the time. It is part of the department’s Emergency Medical Services contract with Santa Clara County. The county pays San Jose firefighters about $2.1 million annually to meet that eight-minute requirement. 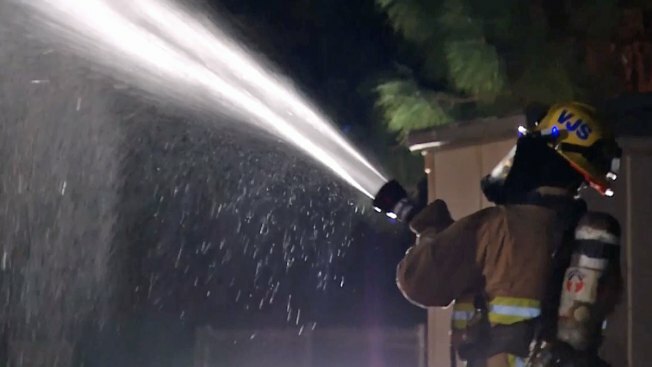 The county has similar contracts with eight other fire departments, but the San Jose Fire Department is the only agency that’s fallen short of its time requirements. The department has failed to meet the required response times for the past 14 months, according to the data they provided the county. Just this week, the Board of Supervisors voted to suspend its funding and fine the department for the breach. However, internal emails and documents obtained by the Investigative Unit show the numbers may be even worse. The Investigative Unit filed a California Public Records Act Request back in November, asking for emails and documentation pertaining to response times over the last few years. Thousands of pages of records show the city may never have met its time requirements. The city claimed it met goal of 90 percent of arrivals in under eight minutes for six months in 2012, but we found those numbers were incorrect. Acting SJFD Chief Ruben Torres told the Investigative Unit the revised numbers will be under the 90 percent mark. Simitian has been vocal about San Jose not meeting its response times, but he had not seen the internal documents NBC Bay Area obtained. The Investigative Unit also showed Simitian the below email from last May that reveals fire officials talking about “applying new rules” to calculate response times. Another email on the same chain references finding “20 calls” to take out to help them meet time requirements. A former SJFD firefighter who wishes to remain anonymous due to fear of retaliation, also spoke with the Investigative Unit. This firefighter, who wished to remain anonymous, told the Investigative Unit that there was pressure to make response times appear better than they were. “I know when I was responding to these calls, I would see circumstances where they were trying to make adjustments on how they recorded the data, the information on the response times,” the former SJFD firefighter told the Investigative Unit. “I think we have some issues with all of our data,” Torres said. Chief Torres sat down with the Investigative Unit to discuss the numbers for the first time since he was appointed last August. The Investigative Unit asked him if the 2012 data reported to the county was accurate. “Looking back at the data, I would say, yes, those numbers are going to be lower,” he responded. Torres said the actual latest percentage of county calls in under eight minutes is around 83 percent, below the 90 percent required by the contract. The Investigative Unit also found an internal document that showed San Jose has also not been upfront about meeting its own internal standard: to be at all medical and fire calls in under eight minutes 80 percent of the time. Adding to the confusion, the department calculates this response time differently than it does for the county. The department reported it met its own internal standard 79-80 percent of the time last November, but new calculations in this memo show, it met the standard less than 62 percent of the time. “I wasn’t involved with the data at the time so I don’t really know,” he continued. As for those internal emails from last summer discussing how to get closer to SJFD’s 90 percent under eight minutes obligation, Torres said he believes staff was attempting to figure out the specifics of the complex county contract that calculates response times differently than SJFD does internally . “What this tells me is they were trying to figure out what adjustments needed to be made, what exceptions were allowed through the contract,” Torres said. Torres also highlighted that SJFD’s budget cuts in the past few years has made it one of the leanest departments in the country and in turn, has affected its ability to meet those standards. “It does feel as if we weren’t told the entire truth intentionally,” County Executive Jeff Smith, who oversees the contract SJFD has with the county. Even though the contract stipulates certain fines for not meeting response times, San Jose has been given a pass for months, not receiving any penalties until this week. Smith says he believed at the time, revoking SJFD’s funding would not have helped solve the problem. “In retrospect, it probably was not a wise idea to let them off the hook so early,” he continued. But the question remains: how long will that take? “If the system is broken then the system needs to get fixed and it needs to get fixed pretty damn fast or there’s gonna be a life loss that could’ve been saved,” Simitian said.